"This is a super fast and simple to make granola that comes out tender, crisp and delicious every time! 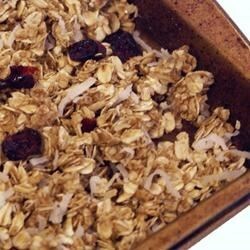 It's very versatile, simply add your favorite dried fruits, nuts, toasted coconut, etc. If you prefer your granola harder, just cook it a little longer at the end. Using butter will give it a deeper/heavier flavor, oil gives it a lighter flavor, more like the commercial granolas you find at your grocery store." Heat the olive oil in a large stockpot over medium heat. Combine the oats and cinnamon and add them to the pot. Cook and stir until lightly toasted, stirring constantly, 3 to 4 minutes. Pour the oats out onto a large baking sheet and add the butter to the pot. When the butter has melted, stir in the honey, molasses and brown sugar. When the mixture starts to simmer, return the oats to the pot and continue to cook and stir until coated and hot. Remove from the heat and stir in the almonds and cherries. Pour onto a large cookie sheet and allow to cool. The granola will harden as it cools. When cool, transfer to an airtight container and store at room temperature. Simple stovetop granola with fruit and some extra sweetness! Tasted good, but it turned out like cereal. Didn't stick together. I even put half a batch into my dehydrator to see what would happen, and it crumbled into little flavored oats and fruit.